Ok, this was actually a film in 2011 but in Malaysia, it was just recently released. I manage to catch the movie on Thursday, February 9, 2012. War Horse is about the tale of a horse during the period of World War I. The horse was first conceived in a town called Devon where a young chap by the name of Albert Narracott (Jeremy Irvine) watched with fascination. When the horse had grew into a young horse, a colt, he was auctioned off and somehow the father of Albert, Ted Narracott (Peter Mullan) bought the horse even though he was supposed to get a strong plow horse to plow his land into a fertile land fit for planting crops. After the dismay of his wife and the excitement of his son, Albert gleefully volunteered to train up the horse to be a plow horse. But time wasn't on his side as the landlord came by and asked for his rent. The landlord agreed to make a bargain with them which seemed impossible at that time due to the horse being too young and weak to plow that if the horse manages to plow their field the next day, they had until harvest time to pay the rent with interest. Out of frustration and anger, Ted wanted to kill the horse with his shotgun, but Albert won't allow him and persuaded him that he'll be able to do it. On the next day, Albert took the horse to the stony field (which even a plow horse will have difficulty doing it) hoping for a miracle. With the villagers watching the spectacle, it seemed hopeless in the beginning. But as rain fall, it has managed to soften the ground and the horse seemed to has amazed everyone with him and Albert managing to plow the field. War time came along and not having any crops due to a heavy thunderstorm one night destroying all the crops, Ted sold the horse to the army where the Captain Nicholls (Tom Hiddleston) has promised to watch over the horse and take care of it and if possible return it back to him when the war's over. Unfortunately, Captain Nicholls died in action and the horse from then on started to change hands to many people starting off with the opposition army which killed Captain Nicholls. 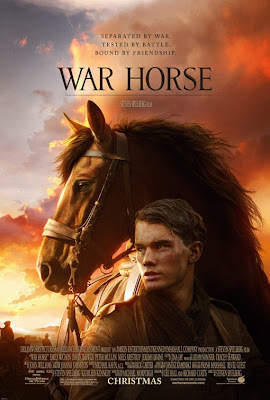 Watch the movie to find out the journey and story of the horse in wartime. This movie was unexpectedly a work of art to me. The plain and simple title and storyline doesn't do justice to how incredibly pleasant and heart warming it is to watch. A very nice movie indeed. I would award it 4.5 stars out of 5. It's a really nice movie.